As a supplier and manufacturer in China ,we can offer you many kinds of table saws. A table saw or sawbench is the most common piece of large woodworking equipment. Because of its versatility, when only one piece of large woodworking machinery is owned, it will often be a table saw. The saw consists of a circular saw blade, mounted on an arbor, that is driven by an electric motor (either directly or by belt or gears). The blade protrudes through the surface of a table, which provides support for the material (usually wood) being cut. There are four general classes of table saws: benchtop table saws, contractor saws, cabinet saws and hybrid saws. In modern table saws, the depth of the cut is varied by adjusting the amount of the blade that protrudes above the table surface: the higher the blade protrudes above the table, the deeper the cut that is made in the material. In some early table saws, the blade and arbor were fixed, and the table was moved up and down to expose more or less of the blade. The angle of cut is controlled by adjusting the angle of blade. Some earlier saws angled the table to control the cut angle. 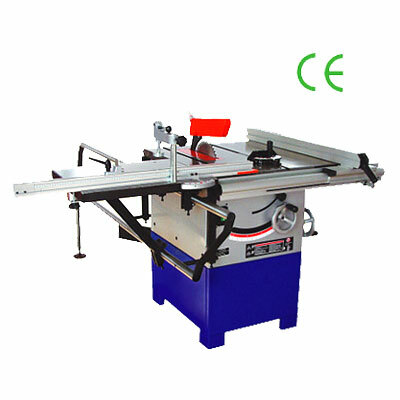 Benchtop table saws are lightweight and are designed to operate while sitting on a table or other support. They commonly have direct drive (no v-belt or pulleys) from an universal type motor. They can be lifted by one person and carried to the job location. These saws often have parts made of steel, aluminum and plastic and are designed to be compact and light. Benchtop saws are the least expensive and least capable of the three major types, however, they can offer adequate capacity and precision for many tasks. The universal motor is not as durable or as quiet as a brushless AC motor, but offers more power relative to its size and weight. The top of a benchtop table saw is narrower than contractor and cabinet saws, so the width of stock that can be ripped is reduced. Another restriction results from the top being smaller from the front of the tabletop to the rear. This results in a shorter rip fence, which makes it harder to make a clean, straight cut when ripping. Also, there is less distance from the front edge of the tabletop to the blade, which makes cross cutting stock using a miter more difficult (the miter and/or stock may not be fully supported by the table in front of the blade). Benchtop saws are the smallest type of table saw and have the least mass, potentially resulting in increased vibration during a cut. Contractor table saws are heavier, larger and have an attached stand or base, often with wheels. The motor hinges off the rear of the saw and drives the blade via a single belt using a 1 to 2 hp (750 to 1500 W) induction type motor. This is the type often used by hobbyists and homeowners because standard electrical circuits are adequate and due to its low cost. Because the motor hangs off the rear of the saw on a pivot, dust collection can be problematic in comparison with a cabinet saw. Cabinet table saws are heavy (using large amounts of cast iron and steel) to minimize vibration and increase accuracy. A cabinet saw is characterized by having a closed (cabinet) base. Cabinet saws usually have induction motors in the 3 to 5 hp (2 to 4 kW) range. For home use, this type of motor typically requires that a heavy circuit be installed (in the US, this requires a 220V outlet). The motor is enclosed within the cabinet and drives the blade with three parallel v-belts. Cabinet saws are heavier and offer the following advantages over contractor saws: heavier construction for lower vibration and increased durability; a cabinet-mounted trunnion (the mechanism that incorporates the sawblade mount and allows for height and tilt adjustment); improved dust collection due to the totally enclosed cabinet and common incorporation of a dust collection port. In general, cabinet-mounted trunnions are easier to adjust than table-mounted trunnions. American style cabinet saws differ in design from European style cabinet saws. American style saws generally follow the model of the Delta Unisaw, a design that has evolved since 1939. Saws of this general type are made in the USA, Canada and China. These saws are characterized by a cast iron top on a full-length steel base, square in section, with radiused corners. Two 3/8" deep by 3/4" wide miter slots are located parallel to the blade, one to the left of the blade and one to the right. The most common type of rip fence mounted to this type of saw is characterized by the standard model made by Biesemeyer. This very sturdy, steel T-type fence mounts to a steel rail at the front of the saw. It has replaceable laminate faces. American cabinet saws are normally designed to accept a 13/16" wide stacked dado blade in addition to a standard saw blade. The most common size of blade capacity is 10" in diameter. The blade arbor has a diameter of 5/8". American saws normally include an anti-kickback device that incorporates a splitter, toothed anti-kickback pawls and a clear plastic blade cover. American style saws have an easily replaceable insert around the blade in the table top. This allows the use of zero-clearance inserts, which greatly reduce tearout on the bottom of the workpiece. It is common for this type of saw to be equipped with a table extension that increases ripping capacity for sheet goods. American style table saws are commonly available with the option of left or right tilt blade capability. While relatively simple in design, these saws are highly evolved and capable of efficient and precision work. European style cabinet saws are often more complex and modern in design compared to American types. They often are equipped with a sliding table to make cross cuts easier and safer than by the use of an American style miter gauge. Unless modified for the American market, European table saws are not equipped to allow the use of a stacked dado blade set (this is due to safety laws in European markets). Rip fences on European saws tend to be of lighter construction and less smooth in operation compared to American cabinet saws. European cabinet saws are often available in multi-purpose tool configurations that can offer jointer, planer, shaper or boring features. The blade arbor typically has a diameter of 30mm, though for the American market a 5/8" arbor is commonly available as an option. Note that American woodworkers are likely to use a stacked dado blade to cut dados (square sectioned grooves) where European woodworkers might use a shaper or other tool for this task. European cabinet saws often incorporate a riving knife to prevent kickback. Riving knives differ from American style splitters in that they rise and fall with the blade (splitters are fixed in place without regard for the height that the blade is adjusted to). European cabinet saws often offer as an option a scoring blade, which is a second, smaller diameter blade mounted in front of the regular saw blade. The scoring blade helps reduce splintering in certain types of stock, especially laminated stock. Hybrid table saws are designed to compete in the market with high-end contractor table saws. They offer some of the advantages of cabinet saws at a lower price than traditional cabinet saws. Hybrid saws on the market today offer an enclosed cabinet to help improve dust collection. The cabinet can either be similar to a cabinet saw with a full enclosure from the table top to the floor or a shorter cabinet on legs. Some hybrid saws have cabinet-mounted trunnions and some have table-mounted trunnions. Hybrid saws tend to be heavier than contractor saws and lighter than cabinet saws. Some hybrid saws offer a sliding table as an option to improve cross cutting capability. Hybrid saw drive mechanisms vary more than contractor saws and cabinet saws. Drive mechanisms can be a single v-belt, a serpentine belt or multiple v-belts. Rip fence: Table saws have a fence (guide) running from the front of the table (the side nearest the operator) to the back, parallel to the cutting plane of the blade. The distance of the fence from the blade can be adjusted, which determines where on the workpiece the cut is made. The fence is commonly called a "rip fence" referring to its use in guiding the workpiece during the process of making a rip cut. Most table saws come standard with a rip fence, however some high end saws are available without a fence so a fence of the user's choice can be purchased separately. Miter gauge: The table has one or two grooves running from front to back, also parallel to the cutting plane of the blade. These miter slots (or miter grooves) are used to position and guide either a miter gauge (also known as a crosscut fence) or crosscut sled. The miter gauge is usually set to be at 90 degrees to the plane of the blade's cut, so as to cause the cut made in the workpiece to be made at a right angle. The miter gauge can also be adjusted to cause the cut to be made at a precisely controlled angle (a so-called miter cut). Crosscut sled: A crosscut sled is generally used to hold the workpiece at a fixed 90 degree angle to the blade, allowing precise repeatable cuts at the most commonly used angle. The sled is normally guided by a runner fastened under it that slide in a miter slot. This device is normally shop made, but can be purchased. Tenon jig: A tenon jig is a device that holds the workpiece vertically so cuts can be made across the end. This allows tenons to be formed. Often this is a purchased item, but it can be shop made. Stacked dado: Saws made for the US market are generally capable of using a stacked dado blade set. This is a kit with two outer blades and a number of inner chip cutters that can be used to cut dados (grooves in the workpiece) of any width up to the maximum (generally 7/8 of an inch). Stacked dado sets are available in 6 inch and 8 inch diameters. Inserts: Table saws have a changeable insert in the table through which the blade projects. Purchasable inserts are usually made out of metal. Zero-Clearance inserts can be made of a sawable material such as plastic or wood. When a Zero-Clearance insert is initially inserted, the blade is raised through the insert creating the slot. This creates a slot with no gaps around the blade. The zero clearance insert helps prevent tearout by providing support for wood fibers right next to the blade thus helping to make a very clean cut. Other inserts can be bought or created in the same manner, such as a dado insert. Splitter: A splitter is a vertical projection located behind the saw blade. This "fin" is slightly narrower in width than the blade and located directly in line with the blade. The splitter prevents the material being cut from being rotated thereby helping to prevent kickback. Splitters may also have two small "wings" that grab the wood from being flown backwards during the event of kickback. Read all warning labels and the owner's manual before operating the saw. When the saw is not in operation, it is a good habit to lower the blade below the table. Be sure the power is disconnected when performing maintenance or changing blades on the saw. Use a push stick or other such safety device when making cuts that would otherwise require fingers to be near the blade. Never operate the saw in a way that your fingers advance into the path of the blade. Always be fully present and alert, as this piece of equipment causes more serious injuries than anything else in the shop. Many experienced woodworkers know someone who has lost a finger. Keep the blade guard in place whenever possible. If you do not like the guard that came with the saw, it is possible to purchase aftermarket guards of various configurations. Note that one of the main functions of a typical blade guard is to act as a splitter, which helps prevent the cut in the wood from closing and pinching the back of the blade and kicking back. Sometimes the blade guard is more of a danger than a safety feature, most commonly during smaller cuts (less than 3 inches), and cuts with a push stick, and should be removed. Wear eye protection. Eye protection is paramount while operating all power tools. When operating a table saw, it is particularly important. The rotational mass of a spinning saw blade combined with a large electric motor can contribute to the violent and unexpected ejection of material. Safety glasses should fully encompass the eye area, including the front and sides of the eye. Good safety glasses should be comfortable so they are always worn when needed. Wear ear protection. Wear ear protection to prevent the steady loss of hearing that occurs when using power equipment without protection. Wear clothing that is not excessively loose-fitting. Wearing loose-fitting clothing can be dangerous if it comes in contact with the blade. This not only applies to table saws, but all power tools, especially jointers. Cuffs should always be buttoned when wearing a longsleeve shirt. The table saw must be adjusted so the blade is perfectly parallel with the fence and the miter slots. If it is not parallel, the workpiece can easily become pinched between the blade and the fence, inducing violent kickback and causing injury. The manufacturer of the table saw will very likely send a manual free of charge. Always push the material past the saw when finishing a cut. Pieces not pushed far enough past the blade can get caught and violently drawn into the blade, resulting in kickback. Operate the saw defensively. This is probably the most dangerous piece of equipment that a woodworker will ever use. The nature of wood includes variations in structure and internal forces. It is not uncommon for natural stresses in a piece of wood to cause the blade to be pinched and thrown violently. Do not work in a way that such an event might result in injury. It is paramount to THINK carefully and operate cautiously. Kickback is caused when the blade catches the workpiece and violently throws it back to the rear of the saw, towards the operator. It can be thrown very hard and can injure the operator. It is not uncommon for the object to have high enough velocity to become embedded in a wall or to cause other damage or injury. Blade must be sharp and clean. Novices often do not recognize the importance of using a clean and sharp blade. Pitch buildup on a blade greatly increases friction and decreases the quality of the cut, causing burning. Pitch also increases the probability of kickback. Saw must be aligned. The blade must be adjusted so that it is parallel with the miter grooves and the rip fence. If the blade is out of parallel, it is possible for the workpiece to be pinched between the blade and the rip fence, which will cause violent kickback. Use the blade guard when possible. The blade guard on typical American market saws incorporates a spreader, which helps prevent the cut from closing on the back of the saw blade. Natural tension can exist in wood that causes the cut to close. Some blade guards have anti-kickback devices that allow only forward travel past the blade. Push the workpiece past the blade. Do not release a workpiece until it is past the blade and removed from the saw. Turn the saw off before removing small cut off pieces. Always maintain control. Do not execute a cut where you do not have complete control of the situation. Make sure there are no obstructions. Do not cut a workpiece that is too large to handle. Do not use the rip fence as a guide during crosscuts. If you need to make a series of equal length crosscuts, use a stop block in front of the blade so the workpiece is not in contact with the rip fence during the cut. It is easy for the workpiece to twist out of perpendicular at the end of the cut and thus get caught by the blade and thrown.